Coburg Gallery is open everyday now up until the 23rd Dec including weekends! So if you've not been down to see what gorgeous presents you can buy for christmas, or have been and think you've missed the chance to buy what you had your eye on, don't panic! The gallery is open everyday from 12 till 6pm, and thursdays until 8pm. 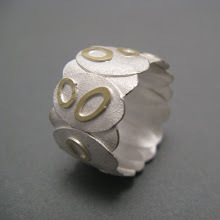 Just posted up some images of new range no.2 (scroll down on the right under contact details). I've been working on this alongside range no.1 (see previous post) over the last few weeks. 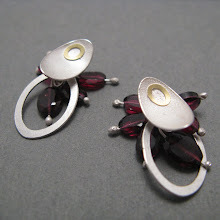 These pieces came from the cufflink shapes and forms. With this range, I wanted to create something simple and easy to wear. I'm pretty tired this evening, so I'll leave it at that. 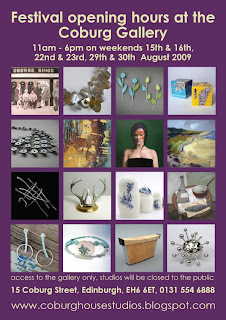 I'm off to London tomorrow for 'Made in Clerkenwell', so best be off to finish the rest of my packing and early night. The Snowbud range with stones have been moved further down on the right. Friday was a day of triumph! 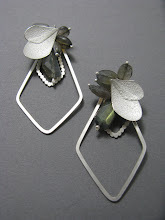 I finally finished my new jewels for the Open Studios galore this month. I would have carried on making until the bitter end, but I ran out of stones and almost all my silver! Just as well, as it has given me the chance to organize myself with pricing and display etc etc, all the usual tedious stuff at the end. So, it's down to London I go on Thursday and looking forward to seeing Helen and Andrea (see previous post). I'm also intrigued to see how this new collection of work will go down! The necklace above is THE special piece of this collection. 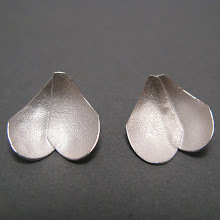 It is made from silver & labradorites. Above this post, I have added some more new pieces from this range. 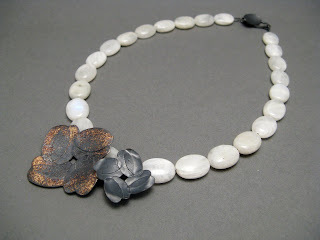 Other stones which I have used are Rhodochrosites, garnets and white moonstones. I do have another range to release, but I think it would be too much for you to take in all at once! Well, maybe it's because I just can't take anymore downloading images today! I have a new stockist in Hampstead. Jiq Jaq gallery will have my work on sale from the first week in December! I am in the studio on a Sunday once again! Yes, it is true. I have no social life! Roll on Christmas! I have been busy working away at the studio all weekend and have managed to get quite alot done! 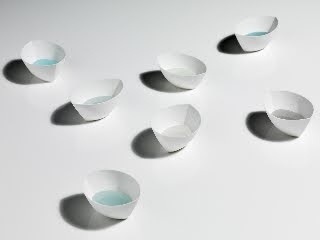 I am currently working on new work for 'Made in Clerkenwell' Winter Open Studios. For details, check the Craft Central link on the side. The talented Helen Beard has kindly offered myself and fellow Coburger Andrea Walsh to share her studio especially for Craft Central's Open Studio weekend. We will all being showing our work together. Check out their websites. 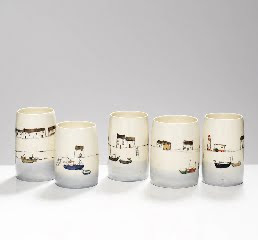 Both Helen (bottom image) and Andrea (middle) produce beautiful ceramics. They are probably my two favorite ceramicists. I'm not bias!!! While I was in London last month I made a visit to Hatton Garden and bought some lovely strings of stones. My favorite ones are some rough cut labradorites which I have incorporated into a new large cluster neckpiece. I am quite excited about it! Once I have made some other pieces with these stones, I wil post some pics up. 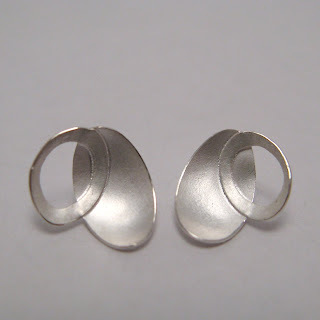 I am also working on some other designs which tie in a little with the some of the cufflink shapes and forms. 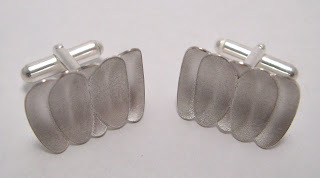 And finally.........although a bit late, as promised I have posted some more pics of the new cufflinks (above). Hope you like. Not all the photos are great as some of them were taken in a bit of a rush before send off for Dazzle! Here are some of the cufflinks I have been making over the last two weeks. There are quite a few other designs and hopefully variations of each. 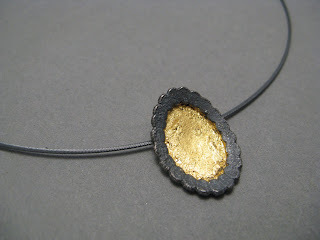 For example, oxidizing, texture and gold leaf. I haven't used gold leaf since I was at college, but thought I would give it a go and see how it would look. I'll let you know how it turns out. I haven't done any men's jewellery at all before. I thought it would be good to broaden my range and market. 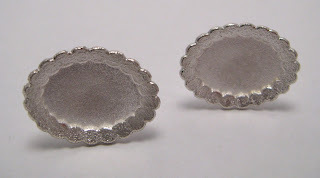 Actually, I did make a pair of cufflinks once as a present but they were just too dainty for a man and broke quite quickly! I guess I've always just been used to making feminine, light jewellery! I promise you though, these aren't! And they won't break! 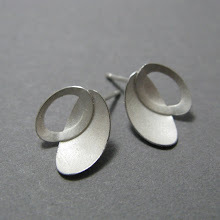 Another reason I wanted to try the cufflinks was to get me thinking of new ideas and something a bit chunkier. At the DAZZLE exhibition in London (check link for details) there is always a separate section for men. Thinking I might add a couple of small man brooches in there which are in the middle of production as we speak! Not sure about them just yet or whether there is a market for man brooches? Not long back from bag making class which was good. It has been a long day, so relaxing bath, then bed for me. Not so much chat and more work! I have today managed to finish my collection for the 'Gifted' exhibition at The National Museum of Scotland. I'm quite suprised at myself for having the work ready so far in advance! This image will be used for my postcards which the NMS will design and print. It has been very quiet here at the studio without the girls, who are all sell sell selling down at Origin and Goldsmith's Fair! However, I have had the company of wee Merryn and Leon (The King, as he is known) all day. Talking to the dogs, maybe a sign of me going mad! Well, I'm off to my bag making class in a bit. 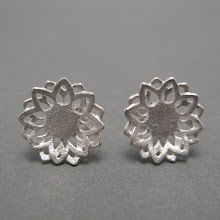 May post again later, as I have been working on a range of cufflinks for the men's Dazzle. I'm working on some new things at the moment, so watch this space! Well, here's the spoon. There were a couple of small changes along the way as usual. 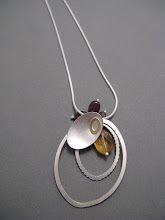 I haven't really made anything other than jewellery for a few years now. It was quite refreshing to work on something that isn't to be worn for a change. No pin, no catch, nothing! A practical object, maybe not, but it is still only the beginning of an idea. A testpiece really. I like the fact that it looks like two different pieces. Maybe there will be more spoons to come. Who knows....maybe when I have a bit more spare time on my hands. Getting up late this morning after another night shift at Dazzle, I made it to the studio for the first time in a week! It was a slow start but quite productive in the end. 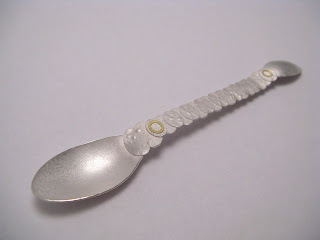 I was asked last week to come up with a spoon for an exhibition at the Scottish Gallery which opens next week! 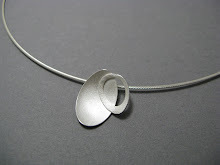 www.scottish-gallery.co.uk The exhibition will include spoons designed and made by a number of established contemporary jewellers and silversmiths. 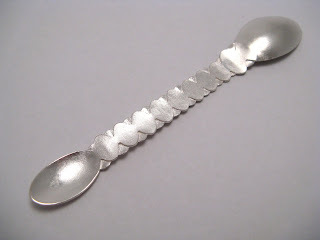 Grace Girvan, another fabulous fellow jeweller at Coburg House (check links) made me aware of the term 'You Spoon!" today. I think it's maybe a scottish thing! Still not quite sure how you would define the word, but Grace says it's like saying 'You Tube!'. Another scottish term! I suspect it just means 'silly'. 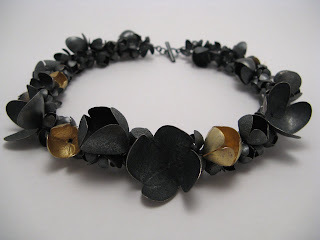 Haven't managed to get much done at the studio this week as I've been working at the flower shop and Dazzle. We had a post Open studio meeting last night which was followed by a few bottles of wine, and some rather drunken chat at Sopi's! Today started off in a bit of a daze, but we managed to make quite a few sales in the end! Apart from that, what time I have spent in the studio this week has been spent thinking about what to do next. I am feeling in need of a change and perhaps creating a new range. This has meant going back to the drawing board literally. This new collection may or may not happen, depending on time scale, as I do have a few deadlines to work towards now. For those of you who still haven't seen our new gallery space, our summer exhibition is still running and open for business on the weekends, Saturday & Sunday 11-6 during the festival. This week has been yet another busy one! There hasn't been much of a chance to recover from the Open Studios. The past three nights I have been working at the Dazzle exhibition at the Traverse Theatre (check links for details). Myself and coburg jewellers, Kaz, Hannah Louise Lamb and Sally Grant (check links) all had our work featured in the Edinburgh evening news on Monday, advertising Dazzle. Our work was modeled by the gorgeous fellow coburg jeweller Erin Daly. 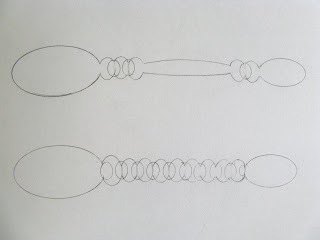 I don't have a link for Erin, but you can view an image of her work on the coburg blog. 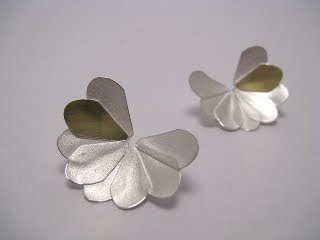 The 'Corolla' earrings above are one of the pieces that were modeled for the paper and are on sale at Dazzle now for £95. On the right (below blog archives), I have added some more images of work I have sitting in the studio. I just have to work out where I will be sending them next! After a long stressful week, the Open studios weekend finally kicked off yesterday and with great success! Doors opened for the private view at 6pm and very quickly all three floors were full of curious people! Regulars and newcomers were both loving our new gallery space! Plenty of sales, wine, and hangovers have been had by all! There's still tomorrow to go so fingers crossed for some sales :) If you haven't been down yet, do so. The studio doors will be closing at 6pm tomorrow. Above are some photos of the opening and buzzing atmosphere at Coburg House last night! The Big Clean Up Day! After getting the communal spaces cleaned and presentable, it was time to tackle the mess in mine and Kaz's studio! The picture above is just a small 'before' example of just how messy and disorganised the whole studio was this morning! I will post some 'after' shots when the open weedend is in action. For details of the open studio weekend check the studios blog www.coburghousestudios.blogspot.com Next I will need to set up my work. This isn't going to happen until Thursday! Leaving it till the last minute as usual, but Dazzle duties are calling! I will be spending the next couple of days at The Traverse Theatre setting up the Dazzle Exhibition. For those of you who haven't heard of Dazzle, check out www.dazzle-exhibitions.com The Edinburgh Dazzle exhibition starts on the 7th Aug and will be on throughout the festival ending on the 31st Aug. Preparing or NOT preparing for the week ahead! Today has not been very productive. But then I guess it is Sunday! I was meant to start gutting the studio so there wasn't much work to do in the week (as there is little time as there is!). However, I did pop into the studio to hand in my work for the Coburg Gallery in preparation for the Open Studio exhibition. Here are the three pieces I will be displaying in our new gallery! None of them are new pieces but I thought they would sit nicely as a group. The Daisy wrist corsage (first photo above) was made a couple of years ago as part of a limited addition. There are about 6 or 7 in total. The idea came from making up buttonholes, bag corsages and wrist corsages for wedding parties and guests at the flower shop. I thought it would be great if you could have a wrist corsage that wasn't made for just one day and then disposed off. 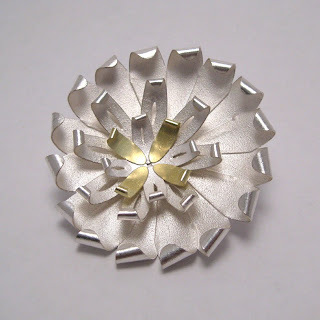 The precious flower has two flat loops on the back where the ribbon threads through. It can be worn tied around the wrist a number of times, or just once with the rest of the ribbon flowing. The ribbon is interchangeable, so you can wear any colour to suit your outfit for your special occasion.